Tea, Cakes, Vintage Fashion & Hats! 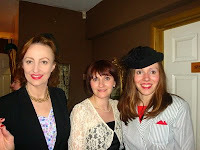 Fun was had by all last Tuesday 28th April at Foxes Cafe Lounge in Carlisle, when a vintage tea party came to town! Goodbye Norma Jean, a vintage clothes shop in Carlisle hosted the evening. 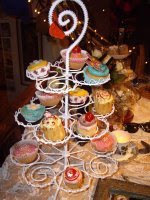 Guests were treated to the most amazing cakes and baby ginger bread men displayed on vintage cake stands! Sara Gadd Millinery also accessorised two of the models, who looked stunning wearing vintage ecclectic pieces! It was so great to see people dressed up and enjoying nostalgic fashion!